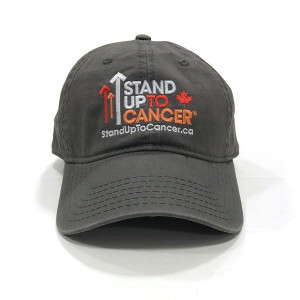 Stand Up with the SU2C Canada Logo Baseball Hat in grey. This hat featuring the Stand Up Logo and the signature Canadian red maple leaf, shares a powerful message that says you stand with those in the fight. Great hat. Very comfortable. Love the adjustable back. I can wear my thin smartwool hat under it on chilly dog walks. Good materials and construction!